This time last year, I was eagerly anticipating rehearsals of the pantomime, how time flies! Since then I have done so much, so I thought it was time to remember and recall what has happened. Spring brought forth the Hawthorn blossom and first telling of “The Elfin Knight and other stories” a wonderful storytelling and music set with my fabulous husband Jake. Based on the 16th century ballad of the same name, we wove story and music together to tell the tale of Mary and her path to a “true lover” with the help of her wise and very eager Auntie. It is a joy to tell and sing, and work with Jake, and so far we’ve performed it at Mythstories, Shropshire Hills Discovery Centre, and Festival at the Edge. We will be performing “The Elfin Knight” at BLAST! http://www.b-l-a-s-t.co.uk in November, a storytelling club in Bishops Castle, founded by storyteller Amy Douglas. It was wonderful to see how the story unfolded, piece by piece, new things coming to light. Flashes of Awen and moments of “ah!” as we were shown places in the landscape that were in the story and treasures from other stories with a similar theme, showing us that we were on the right track. What began as a 10 minute story, formed at my weekend at Bleddfa, has become a 45 minute set, with music and words “blending perfectly” (audience feedback). We are now rehearsing it again for BLAST! and it is a joy to be back with the characters and having a cup of tea in Auntie’s kitchen. Playing Deirdre – The Villain! Well I had so much fun with “A Midsummer Night’s Dream” that my family and I auditioned for the Pantomime at Ludlow Assembly Rooms, Robin Hood. I had the extreme fortune to be cast as the Sheriff’s Mom – Dierdre. It was amazing to play the baddy! The driving force behind the Sheriff’s evilness, yet still washing and ironing his pants on a daily basis, while “thinking of wicked schemes”. The script was written by Simon Bolton of the acclaimed Ludlow company “Rooftop Theatre” and it was a pleasure to work with him and Paul Sayers, especially after seeing their fabulous version of “Hamlet” last year. The younglings from Go MAD in Ludlow (of which I am co-leader with Simon DeVay) were mostly involved as villagers too, so it was wonderful to see them growing with the production and help them overcome backstage nerves. It was just fabulous to work with Simon on a production too, we have been working together with the “MADlings” since May 2016, but to be onstage doing proper acting with him was just fab, seeing as he’s in 30% of my DVD collection, having been in Merlin, Sherlock, Being Human, among many others. I think, that he, Andy Bainbridge (who played the cat with purrrrfection) and myself just made the most wonderful villainous trio, so thanks to you both for helping me unleash my darker side, MWAH HAA HAA! So that all happened last year, rehearsals started in November, and the run was 8 shows over 5 days in December. So 2017 is now into Febraury, I have storytelling adventures to be going on, and will be trying to keep you up to date with them as they happen! One final thigh slap, Huzzah and a wicked laugh for good measure! And so 8 performances later, Phyllis O’Strate has been played. “The Battle with the Centaurs” is done, the “Tipsy Bacchanals” no longer riot, the “Thrice Three Muses” no longer mourn, and the “Tedious brief scene of Young Pyramus and his Love Thisbe” has been wonderfully played out over and over again. The props and scenery dismantled, the costumes in the wash, and the after show get together is a sweet memory. Fond farewells and “keep in touch” and “good luck for your next project” was mixed with hugs and a few tears. It has been a wondrous adventure, with wondrous people. I have learnt so much, had loads of fun, and will remember it for a long time to come. Thank you to all the cast and crew and Here to There Productions for this fabulous experience. Farewell to Athens 1955, Thisbe’s balloons, Steam Punk fairies, hair grips and pink lipstick, and those horrible tights! Tonight I fulfil a dream. To be on the stage in a play. A play by the Bard himself, William Shakespeare. (why he was not knighted or made a lord of something I do not know!) At school we studied Macbeth, I love that play, and I really wanted to act out the words of Shakespeare. But life went off on a tangent and though I appeared on stage in amateur productions of “The Mikado” and “Ruddigore” as “chorus” ,that career path didn’t happen. Fast forward 30 year (gosh is it really that long ago??) I am a storyteller and Mom of beautiful daughters and through their youth theatre, I met Mel and Carl at Appletree. There was a flier for open auditions for Romeo and Juliet and A Midsummer Night’s Dream. Why not thought I, thinking it would be a good experience, to see what auditions were really like and to see how other people portrayed the characters. To my total surprise, I was offered a part – PHILOSTRATE from Dream. Now you may or may not know, that PHILOSTRATE is butler to Theseus, and Master of Revels, and is very often cut from the play, his part being distributed between Lysander and Egeus. But PHILOSTRATE was Shakespeare’s satire of the theatre system of the time. You could not get a play put on until it had been passed “the Master of Revels” so to playwrights he was hurdle to be overcome! In Here to There Productions “Dream” set in Athens in 1955, PHILOSTRATE becomes “Phyllis O’Strate” a determined spinster Aunt, using her brother Egeus as a stepping stone to climb to new heights in the household of Theseus and Hippolyta. As Aunt to Hermia, she approves of Lysander with his “Nosegays and poetry” as she thinks it terribly romantic and dislikes the overbearing and unfaithful Demetrius, whom her brother would have marry her niece! Thus she is very pleased when the four young lovers are paired more romantically by fairie magic! She appears in Scene 1, and Scene 5, but her spoken part is in Scene 7, where she gives Theseus a list of the marques and merriments available for the evening. Usually either Theseus or Egeus deliver the list, but in this production, Phyllis has a shining moment and delivers some of the best words (in my opinion) ever in a play! Thus the list goes on until the Mechanicals play is the only one left on the list, but to be honest, Phyllis has seen it and thinks it is crap! And in trying to dissuade Theseus, loses her rag a bit, but the play is presented, and she gets to say “The prologue is addressed” with much contempt! So there you have it, a usually overlooked Shakespeare character, but one that I have been given the privilege to play and bring to life. It has been a wonderful few months, meeting all the fabulous folks involved, and learning so much along the way. Rehearsals have been a joy to be at and I shall miss them when it’s over. Who knows, this could be the first step on a new ladder for me – we shall see! There are parallels with storytelling and much to differentiate between the two, especially as engaging with the audience goes, but it has been amazing. Once upon a time, there was a Festival and it happened high up on Wenlock Edge in Shropshire. The first time I went there, it was 2005, and I went there with my now husband of 10 years Jake Thomas. We spent that first festival between the musical Silver Tent, the CAMRA Beer tent and our own tent, sleeping off the beer and music. I did catch a few story tellers though,and that is where my Storytelling journey gained pace. Festival at the Edge has just held it’s 25th gathering of Storytellers, listeners, musicians, glorious food sellers and amazing market stalls, and like the others I have been to, it was an amazing, beautiful and inspiring weekend. In previous years, we have left as the Festival ended, not wanting to see it taken down and put away, somehow keeping it alive in our minds for longer. We stayed an extra night, enjoyed the Sunday night Party (for helpers, stewards and performers) for the first time, and saw everything disappearing back into the land. The Festival village became a field again, the stories whizzed around and then drifted off with the wind, over the Edge and off to the next ears to hear them. We also stayed because we wanted to see it go. It wont be at that same site next year, so we stayed to say goodbye, to a place that has been as much a part of our marriage as it has my story telling journey. We have made many friends through this festival and this year has been no exception. Meeting up with old friends, recently made friends and those we know from “social media” putting faces to names and profile pics and most exciting of all, new friends. This chapter of FaTE has come to an end, but a new one begins, (it’s a real page turner!) Feeling renewed and inspired by Story, and with a rather wonderful Tshirt, I take another step on my own Storytelling path. Summer is a coming in………………. Winter is on her way back to the Northern lands, escorted by the Ice Dragons. The Swallows swoop in, bringing Summer on their wings. Telling tales around the hearth fire to keep out the winter cold is turning into telling tales in open spaces and in marquees and tents across the land! 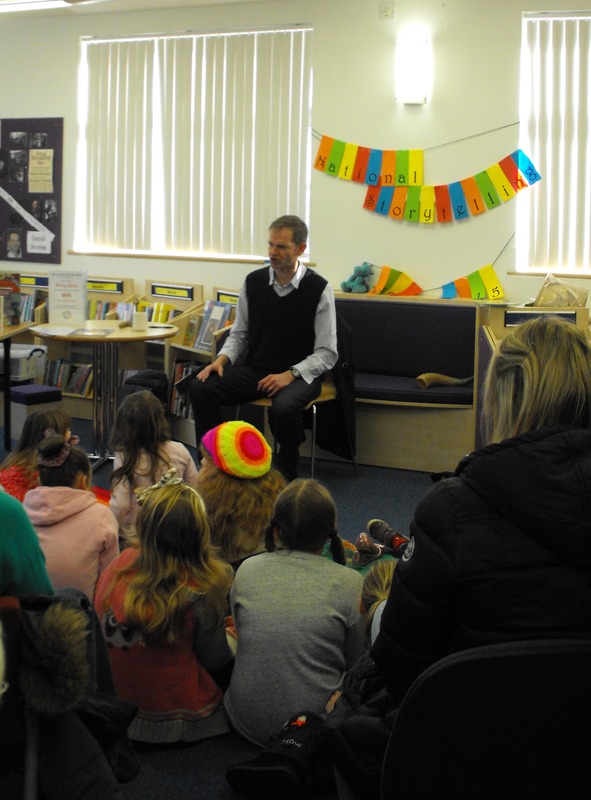 Daniel Morden braved icy mountains at the end of January, to come to Cleobury Mortimer library to tell his tales for one of two events celebrating National Storytelling Week. Daniel Morden being amazing at Cleobury Library. He held the audience in the palm of his hand, at one point making them jump out of their skins, such was his hold! Daniel is one of my favourite storytellers, so I am very grateful to Friends of Cleobury Mortimer Library for running with my ideas, and of course thanks to Daniel for taking us into his stories. Thanks to Russell Drysdale for this photo! 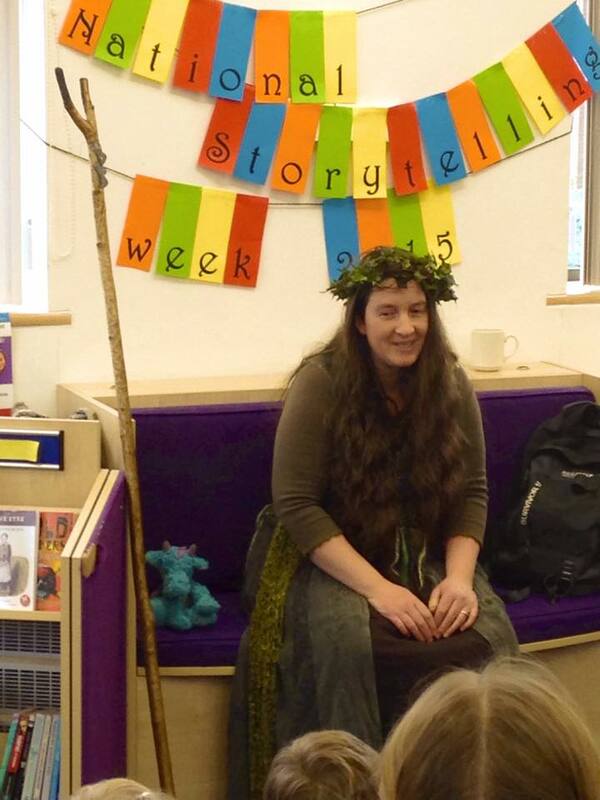 For the second National Storytelling Week event, I went to the library as Dragon Teller with Pratchett, my travelling story dragon by my side, and told my first Dragon Tales of the year. I thoroughly enjoyed telling them, as always, and thankfully the audience enjoyed listening to them too! There have been other ideas, over the Winter, some will happen, some may not. Being a storyteller with no audience is no fun at all. The story wants to come out, but there is no one to tell it to. I feel that the story itself, shuffles off with its head down, a sad expression on its face. Sometimes when you have ideas, you get all excited about them, and want to share, the only trouble is, that sometimes, no one else seems to share the excitement. The sparkle fades, and you wonder why you do it. The Inspiration lies dormant, and you worry about it fading away. This can be disheartening. But just when the sparkle is just a speck of glitter in the dust, someone comes along and blows away the dust and makes it shine again. This week, two people pulled the glitter from the dark. One lady who recognised me from a story corner at a local farm attraction, 2 years ago and remembered the story, saying that her children loved it. The second, a teenager who asked if I was the one who came into school in 2008 and told the story of the Clee Hill Serpent, telling me that is was one of the moments they remembered from their childhood. When moments like this happen, you remember why you do it. It’s to let the story live, to pass it on, to bring the sparkle of story to other people, not to make yourself shine. Here’s to the brilliance of Summer in all her glory, to the stories and to their telling! Have a wonderful summer of storytelling everyone!